It's a big day for IPOs. 1. Two tech IPOs: Square (SQ) and Match Group (MTCH) are going public today in the U.S. even though it has been a difficult year for initial public offerings. The mobile payments firm Square is offering shares for $9 a piece, which is well below the projected price. The offering sets Square's value around $3 billion. That's a huge discount to the $6 billion valuation implied when Square last raised money from private investors a little more than a year ago. Square's CEO and co-founder Jack Dorsey is also the top executive at Twitter (TWTR). Match Group, which owns online dating apps and websites including Tinder and OkCupid, is set to list at $12 per share. The offering will raise nearly $400 million and value the company around $2.8 billion. But Match experienced an awkward moment after the British Evening Standard published a story on Wednesday with inaccurate Tinder user metrics and a lewd comment attributed to Tinder's top executive, Sean Rad. The interview raised questions about whether the company violated its "quiet period," the window between filing a public document and the time the SEC deems it effective. Related: Swipe right or left on Match and Square IPOs? 2. Global market overview: Nearly all global stock markets are moving higher Thursday. U.S. stock futures are pushing up, many European markets are rising by about 1% in early trading and Asian markets ended the day with solid gains. 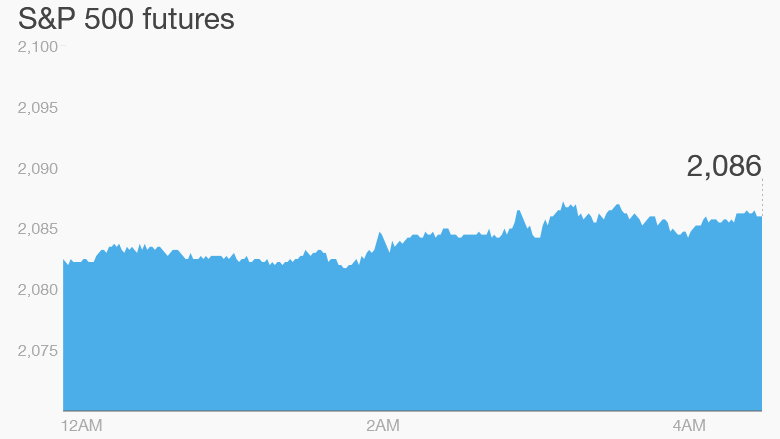 This comes after U.S. markets jumped Wednesday following the release of minutes from the Federal Reserve's October meeting. The minutes indicated the Fed would likely hike interest rates in December, giving investors more certainty about where to allocate their investments. The Fed put rates near zero in December 2008 to help the economy, which was then grappling with a severe recession and housing crisis. Rates haven't budged since, and many experts say the U.S. economy is healthy enough for interest rates to be slowly nudged higher. On Wednesday, the Dow Jones industrial average shot up 1.4%, the S&P 500 charged ahead 1.6% and the Nasdaq rose by 1.8%. 3. Stock market movers -- Keurig, Allergan: Investors are feeling perky after Keurig (GMCR) reported earnings results that blew past expectations on Wednesday evening. Shares in the firm, which makes coffee-brewing machines, are rising by nearly 20%. And Allergan (AGN) stock is jumping by about 3% premarket based on reports that Pfizer (PFE) is closing in on a deal to buy the drug company. After the market closes, investors will hear from retailers including Gap (GPS), Ross (ROST) and Williams-Sonoma (WSM). Specialty food stores The Fresh Market (TFM) and Natural Grocers (NGVC) are also due after the close. 5. Economics: The weekly jobless claims report will come from the federal government at 8:30 am ET. And weekly natural gas inventories data will be updated at 10:30 a.m.